Every year, U.S. florist shops bring in approximately $7 billion — and a considerable portion of that comes from wedding bouquets and wedding table flowers. There is such a thing as affordable wedding flowers, however. By following a few simple tips and choosing the right wedding florists, brides and/or grooms-to-be can save a considerable amount on floral wedding arrangements. What are the best tricks for snagging beautiful — and affordable — flowers? 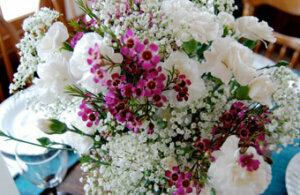 One of the simplest ways to save on wedding flower prices is to pick and choose flowers that are in season. While you may have your heart set on red tulips because Russians view them as the ultimate embodiment of romance and love, going into the process with an open mind (and a willingness to choose from at least a few different varieties of flowers) can do great things for your budget. Sometimes, it’s not necessarily the flowers that are expensive — especially when it comes to table arrangements. There are several inexpensive alternatives to a glass or crystal vase. For a country or rustic-themed wedding, for example, consider replacing vases with mason jars, tin cans wrapped with elegant ribbon, or water pitchers with a spout. This will cut costs while also livening things up a bit and keeping your wedding (and your special day) truly unique. Approximately 90,427 people in the U.S. work as florists (or are employed part- or full-time, also for a florist). That means that you don’t have to select a florist that’s across the country for your wedding flowers. In fact, choosing a local florist will cut down on costs. Ask nearby florists (whether they are online florists or in a physical location) about flowers in the local area. Flowers purchased from a local farm will be cheaper than ones shipped from all over the country. Keep your wedding day special — and your budget and floral arrangement costs low. Think outside of the box, think twice about traditional vases, and purchase bouquets from local florists whenever possible. « Three Ways To Make Your Wedding Flowers Stand Out	» These Wedding Ceremonies And Bouquets Are Down-Right…Different!